Welcome home your little one with this lovely crib bedding set which includes one quilt, one 100% cotton fitted crib sheet, one tiered crib skirt, and one wearable blanket. The quilt is decorated with an array of hearts in metallic gold, soft pink, pastel stripes, and a pretty pink border with pompom trim. 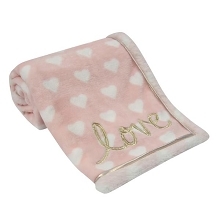 The 100% cotton fitted crib sheet is an open-heart design in pink and gold and has elastic all around for a secure fit. 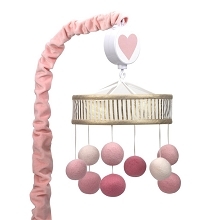 A white tiered crib skirt is trimmed with little pink pompoms and a soft white wearable blanket with a pink velvet heart applique complete this set. The wearable blanket is 100% cotton, 27” in length and fits the 10 to 18 pound range or birth to six months and is recommended for sleep. Cotton/poly blend. Imported.